Adjustable window coverings that let you switch from nearly opaque to nearly invisible at will don’t require any heavy screens or slats. 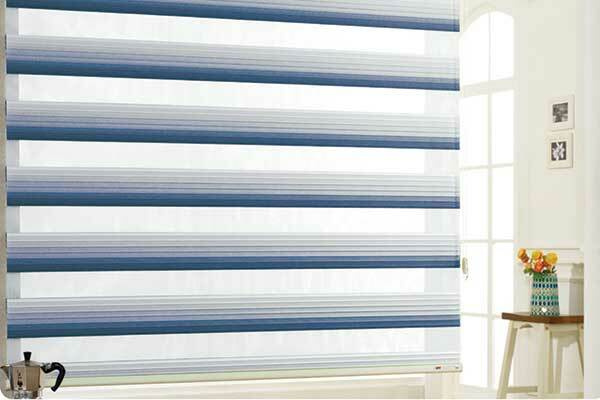 Modern layered shades, with their zebra-like pattern, give you all the benefits of solar screens and blinds in a single, elegant package. A layered shade is made of two different types of fabric sewn together in alternating stripes. Usually, the lighter “stripes” will be made from a thin, sheer material like PVC-coated polyester that lets in most of the visible sunlight, but reflects most of the harmful ultraviolet light. The darker stripes are generally thicker, and made from an opaque fabric that lets a much smaller amount of light through. More importantly, this sheet is double layered, and each layer can be raised or lowered relative to the other. When the dark stripes and light stripes of each layered shade sheet are laid atop one another, you have an open, airy shading that lets in plenty of dappled sunlight and lets you see out the window with ease. Adjust the sheets so that the dark stripes are covering the light ones, and you have a much darker, thicker barrier that lets in only a little bit of heavily strained light and prevents people from seeing in. With layered shades, switching modes is as easy as turning a knob, pulling a string, or pressing a button, and you can adjust the shades to anything in between as well. Layered shades are some of the best window treatments for persistently protecting skin and furniture from ultraviolet radiation while still letting you adjust the degree of visible light and privacy. Aside from the practical concerns, the aesthetics created by layered shades with their striated, faint, and forest-like shadows are unique, and the window itself is definitely more attractive with them on it. Are Layered Shades For You? Maybe. Give Agoura Hills Blinds & Shades a call today, and schedule a free consultation to find out which type of window covering option perfectly matches both your décor and your needs. Get in touch with us today to learn more about layered shades and other window treatment options, including motorized blinds. High-quality custom blinds and shades come in a huge range of styles and materials. As a local business, you'll find us happy to provide free consultations at your home or office, to help make sure you choose the very best product for your specific needs and budget. From beautiful and low maintenance faux wood blinds to various motorized options and high quality roller shades. The range of available window treatments is all encompassing. Browse the rest of our website to learn more. Our competitive pricing guarantees you the best value possible when choosing window coverings from our outstanding selection. Leave your contact information below and we'll get back to you shortly! Look to us for guaranteed satisfaction and the most helpful decorators in town. 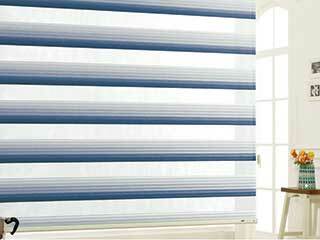 You can always count on us for the best value possible in choosing your blinds and shades. Thank you for choosing Agoura Hills Blinds & Shades! Feel free to browse our website for more useful information until our appointment!